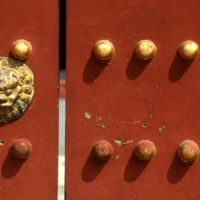 Detail of gateway within Beijing's Temple of Heaven complex, which is missing one of the two lion emblems that ordinarily adorn each door. People sit on a subway car, waiting for their ride to begin. 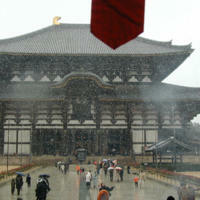 A snowfall in Kyoto doesn't prevent Todaiji, housing a large Buddha, from looking majestic.